With vegan-friendly menus and venues ever on the rise in London, the city's vegan sandwich game is strong. From fast lunches to serious indulgences, we've tracked down London's best vegan wraps, flatbreads and buns. 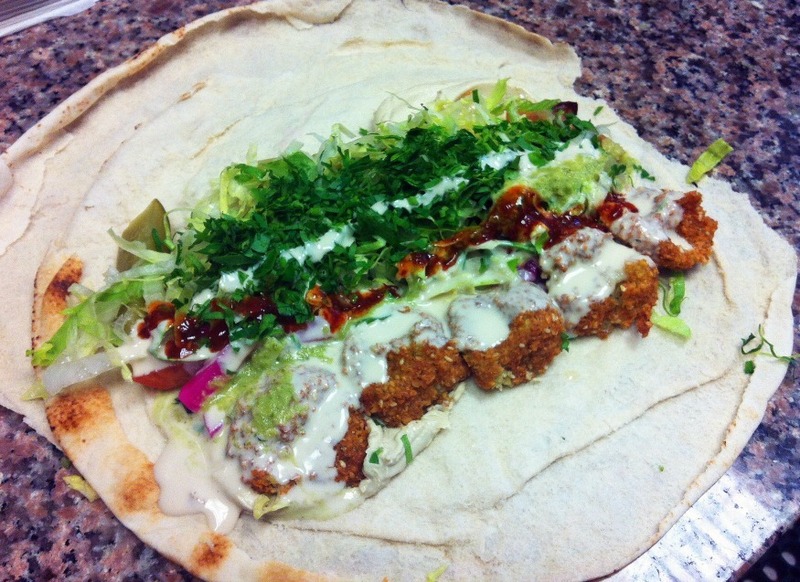 The wrap at Mr. Falafel. Photo: Helen Graves. There's always a vegan wrap or two on the menu at Snackistan, the vegetarian cafe tucked into this Persian grocery store. The menu changes daily but you can always expect ridiculously low prices for a ridiculously good — and substantial — sandwich. Look out for the regular appearance of the timtimo wrap, made with East African-spiced red lentils and doused with vegan yoghurt. Head to VX for 'notorious vegan junk food' and their Philly toasted sandwich. The manifesto at this cafe is that veganism shouldn't be a 'flavourless penance', and the Philly is proof it doesn't have to be. The toasted sandwich is filled with grilled burger, cheese, and a lot of optional fillings to bulk it up — all of them vegan, none of them a penance. Also worth a try if you're hungry is the pulled jackfruit wrap, and vegan ground beef one is decent too. You can supersize them to a genuinely super size for a couple of pounds extra. VX, 73, Caledonian Road, N1 9BT. Juice bar Crussh does way better by vegans than most of its high street parallels, including a decent selection of sandwiches. The five-a-day wheat-free sandwich is more of an old faithful than a dazzling novelty — it's a pretty standard hummus, avocado, sun-dried tomatoes and leaves mix, but liberal enough with all of those to stop it feeling too puritan. The avocado, red pepper and cashew nut tapenade wrap is also worth a try. Who doesn’t love a falafel? A barbarian, that's who. Hoxton Beach also sell salads and baked goods, all entirely vegan and broadly Middle Eastern. But the wraps are the real reason to visit one of their market stalls or outposts (there's one inside London Fields Lido) — chickpea-fava falafels, freshly-fried on stall, along with their signature pickles and an impressive amount of (controversially, no-garlic) hummus. Hoxton Beach, markets all over, including Maltby Street Market at weekends and Whitecross Street Market on weekdays. 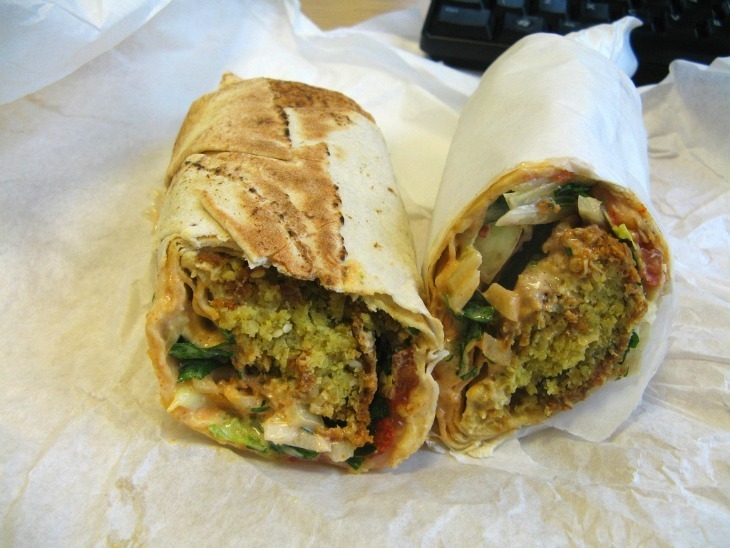 Alright, yes, it's another falafel wrap. But we defy you not to make a place for this Palestinian caff on any 'best sandwich' list, let alone a 'best vegan sandwich' one. The menu runs from the classic falafel, hummus, pickles and salad to 11 other variations on the falafel wrap, many of them vegan. The #4 — falafel and spicy potatoes — is the perfect hit of heat for a winter lunchtime, and now they're on Deliveroo you won't even have to brave the cold to get to it. 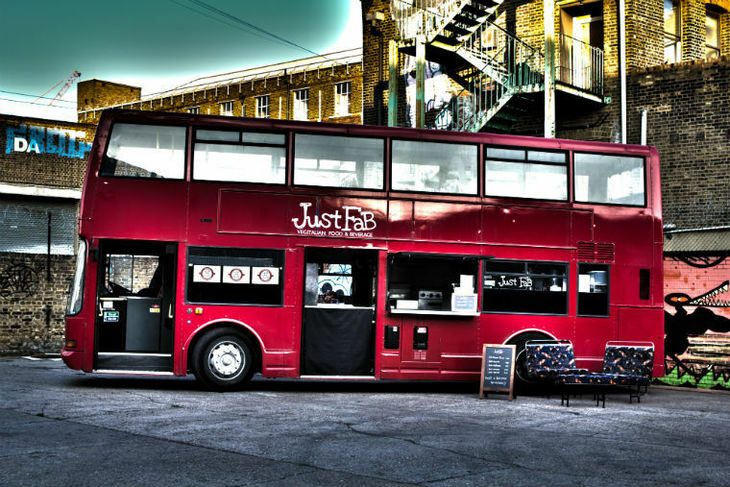 Just Fab's Sicilian street food bus. Comprehensively proving that veganism doesn't have to mean buying into the clean-eating cult is the schiacciata — stuffed Sicilian flatbread — from Just Fab. These Hackney traders serve hot dishes from a double-decker bus on Hackney Road, and manage to make their vegan take on this Italian classic — theirs is stuffed with broccoli, tomatoes, olives and vegan cheese — feel just as indulgent as the non-vegan version. Eat them straight from the fridge: the Scream Sandwiches at Cookies and Scream. 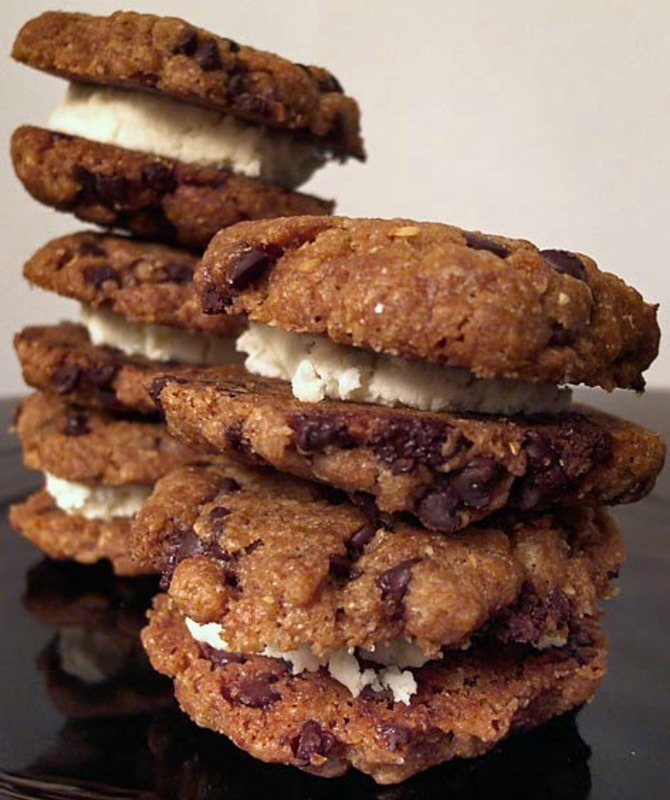 This vegan bakery has graduated from a Camden Lock stall to a permanent cookie bar on Holloway Road, where you can get a seat and coffee to go with the Scream Sandwiches — two chocolate chip cookies glued together with coconut and vanilla paste. 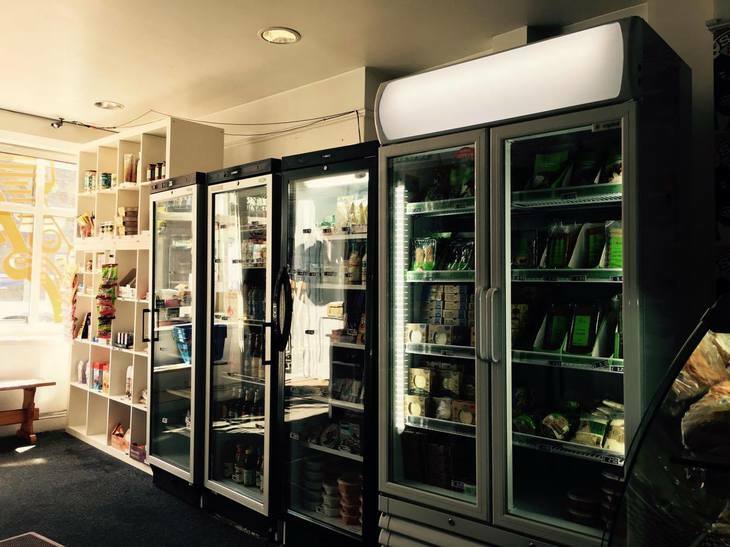 They also do all their products to takeaway, so if you're not nearby enough to make regular visits you can buy in bulk and stockpile Scream Sandwiches in your freezer, to be transferred to the fridge in batches. Layers of carbs, with some stuff in between them. What is a burger, really, but a sandwich for champions? Or that's what we're telling ourselves, to justify making this plant-based burger a regular lunchtime pitstop. Dubbed 'bleeding' thanks to their beetroot juice ruddiness, this is guilt-free, fast-food dining that hits the same cheese-slathered spot as your standard quarter pounder — while being a lot more substantial and satisfying. Proof that vegan food doesn't automatically mean low-cal puritanism. Halo Burger, Pop Brixton, Brixton Station Road, SW9 8PQ.